PanARMENIAN.Net - In Yerevan, VayotsDzor Wine Route was launched by My Armenia Program. The initiative was brought to life with joint efforts of My Armenia and five wineries from the region - Old Bridge, Trinity Canyon Vineyards, Getnatoun, Areni and HinAreni, as a result of participation in the World Wine Forum 2016 in Georgia. During the event, the new webpage (vayotsdzorwineroute.com) of wine route and brochure were presented, which include information about member wineriesandVayotsDzor region’s tourism experiences. 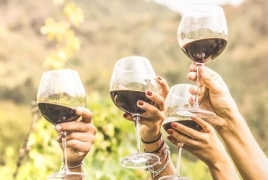 Armenia, which has a millennial history of viticulture and wine making, today has prerequisites to develop a new business culture - wine tourism, along with traditional wine making. The main goal of VayotsDzor wine route development is to present Armenian wine and promote tourism in the region, contributing to the sustainable economic development. In attendance at the event were the Mission Director of USAID Armenia, Deborah Grieser, My Armenia Program Chief of Party, Sisak Mkhitaryan, and the owners of the five wineries that are member of the VayotsDzor Wine Route. - During a study tour to Georgia organized by My Armenia Program, a group of Armenian wine makers realized that the traditions of wine making in their area could become a profitable business, which inspired them to create the wine route. With the support of My Armenia these wine makers from VayotsDzor learned how to start a wine tourism business and be competitive. The Program trained local guides, created marketing materials, including brochures, advertising clips, attractive wine bottle labels. The wine map was created in cooperation with «One Armenia». The road signs will be placed inVayotsDzor. I am sure that the wine route will engage more winemakers from other regions of Armenia very soon,- said DeborahGrieser. - The My Armenia Program continuously supports the creation and development of cultural heritage touristic experiences. This time VayotsDzor is in our focus. The wine route is a unique experience for the visitors to meet the local big and small winemakers and taste the Armenian wine, with the narration of the history of the wine making in this area. Our goal is to make this region more attractive, so that the number of visitors increases, bringing the tourism services and trade to growth, thus developing sustainable income for the regional talented people, - said Sisak Mkhitaryan. - The development of a wine route in Armenia will not only attract more visitors to our region, but also will give a big opportunity to all of us to present the wine making history of Armenia.From now on, by joint efforts we will present the ancient and modern wine making techniques, the different types of Armenian wines, and similarities of wine making in family businesses and large factories, - shared Ashot Khalatyan, Old Bridge Winery representative. «My Armenia Program» organized a visit to VayotsDzorWine Route for the local media the day before the launch event.Eight local media representatives had the opportunity to visit five wineries involved in the wine route, interview the winemakers and broadcast from the wineries.